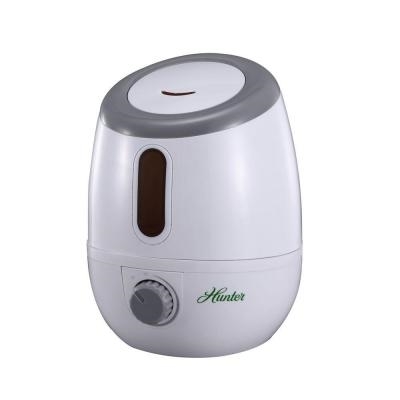 The 1.2 gallon Ultrasonic Humidifier features Visible Cool Mist operation, which allows you to see and feel the soothing sensation for up to 17.5 hours on a single fill. Ultrasonic technology allows for a virtually silent operation and the unit does not require replacement wicks for added convenience. The variable intensity mist output control allows you to control the strength and the direction of the mist. While in operation, the humidifier will help alleviate or reduce chapped lips, cracked, itchy dry skin and even seasonal cold symptoms in the background and it will shut itself off when the tank is empty. It's time for you to put the humidity back into the air and live life comfortably! Dimensions: 9.37" x 8.66" x 11.14"
Nothing was said in the manual about the mineral dust causing the flame on my gas stove to turn yellow. This should have been in the manual as it could cause owners to call a service repair company to come out to fix the gas stove and furnace when there is actually nothing wrong. It is just the minerals in the air from the humidifier causing the yellow flame. Also the mineral dust is a problem as it clings to the TV screen and also can be breathed in and it canÃ¢â‚¬â„¢t be good for your heath. I am not completely happy with this. I may have to stop using it and find a hot steam humidifier.